Sweet & spicy baked plantain chips are the perfect side to go with your favourite burger. Or eat them on their own as an appetizer. 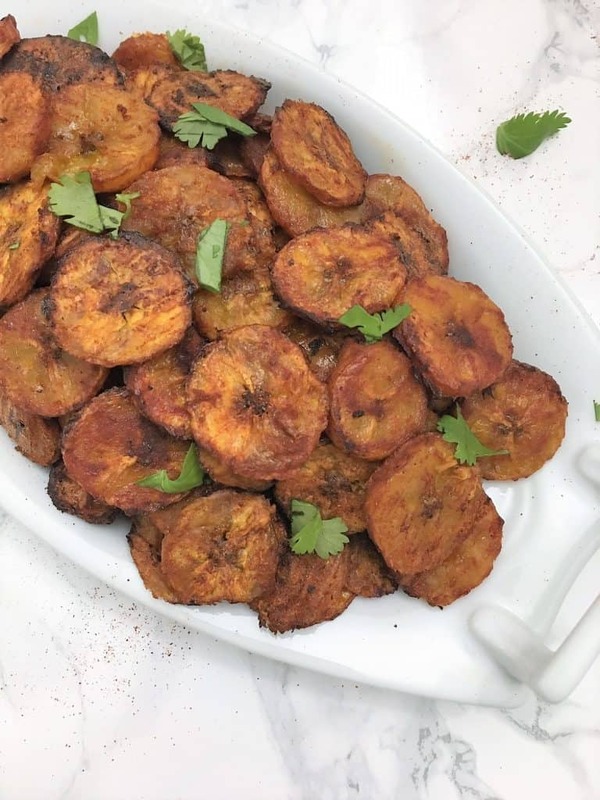 So delicious and crispy, offering hints of sweetness from your ripe plantains and maple syrup, combined with spicy Sriracha and tangy lime juice. These plantain chips are so flavourful, and such a great alternative to potato chips. Make sure you bake them in a single layer, to get all the crispiness out of them as possible. Use the largest baking tray you have so you can leave some space in between each one. This may seem tedious when placing them down, but I promise it’s worth it! 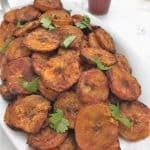 You will get beautiful, crispy, delicious, baked plantain chips using this method. When ready to flip your chips, I use a metal fork to flip each one individually. You want to handle these with care, so you don’t “smoosh” them before they’ve had a chance to crisp up nicely. I bake mine at high heat in a convection bake oven for maximum crispiness. 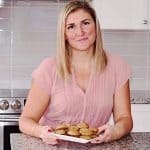 If you do not have a convection bake option, you may want to bake yours for a little longer. Want more healthy-ish pub food you can make yourself at home? Try these AMAZING Vegan Chicken Burgers, Cauliflower Buffalo Wings, or Baked Sweet Potato Fries! 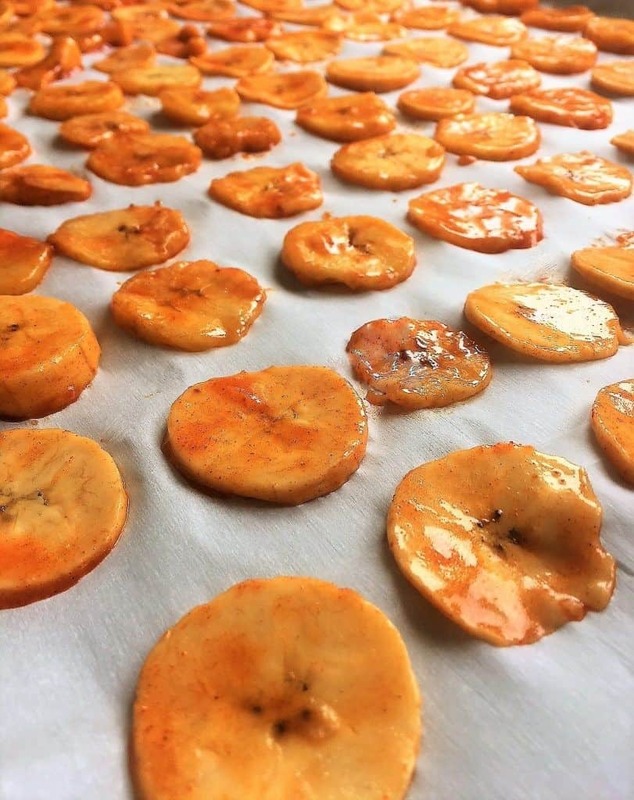 For the ultimate in pub inspired food, give these Baked Plantain Chips a try! They are sweet and spicy, crispy and delicious! Preheat your oven to 425 degrees F convection bake and line a large baking tray with parchment paper. Peel and slice your plantains thinly (about 1/8" thick) and place them in a large bowl. In a small bowl, add all remaining ingredients and mix well. Pour the mixture over your plantains and using your hands, gently mix to coat them. Spread your plantains in a single layer on your prepared baking tray and bake for 15 minutes. Then flip and bake for 5-10 more minutes, until edges are golden brown. Serve & enjoy! Next Next post: Sweet Potato Fries – Baked not Fried!